YANMAR, the Japanese manufacturer of engines, produced more than 15 millions of diesel engines from 4.6 up to 5.000 horse powers since 1933. YANMAR is the leading manufacturer of compact diesel engines worldwide. This compact engines are used in power generators for example. MITTRONIK offers power generators with slow turning YANMAR diesel engines in a range from 7 up to 40 kVA rated power. The high-quality soundproofed housings have a central crane lifting point and forklift pockets as stands for easy transport. Control panel, load terminals and sockets (optional) are mounted behind closed doors. 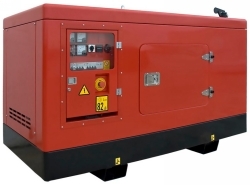 The generator sets of the MYW series are particularly quiet, the sound level is about 55 to 64 dB(A) at 7m distance. A large range of options enable the customization to the requirements. This is valid for emergency power supply or for mobile use on a trailer to deliver electricity for construction sites. Depending on the application, the power generators are availible with manual (analogue or digital instrumentation) or with digital automatic control panel incl. automatic start at mains failure (AMF) function and engine preaheating.